The name “Benedict Arnold” is synonymous with “traitor” in American History. While there is no excusing Arnold’s treachery and broken oath as an American officer, perhaps we have created such a despicable man that we’ve ignored what he actually did for the Colonial Cause. You see, Benedict Arnold was not born with “traitor” stamped on his forehead. However, his treachery is usually all that he’s remembered for. Today, we’ll re-examine the “ideal traitor”, trying to understand his usefulness to America (before his infamous action) and the motives behind his turncoat behavior. Born on January 14, 1741, Arnold grew up in Connecticut and was involved in the maritime shipping industry. He placed more emphasis on acquiring wealth, rather than education. Arnold married and had three sons, but his wife died before the war began. In 1775, he joined the Colonial forces near Boston. Later, he helped capture Fort Ticonderoga, and fought using delaying naval tactics at the Battle of Valcour Island (1776), giving other American troops time to prepare before the British invasion arrived. Arnold led troops at the Battle of Ridgefield, Siege of Fort Stanwix, and the Battles of Saratoga. He was known and admired for his bravery, but he didn’t always cooperate with other American generals. 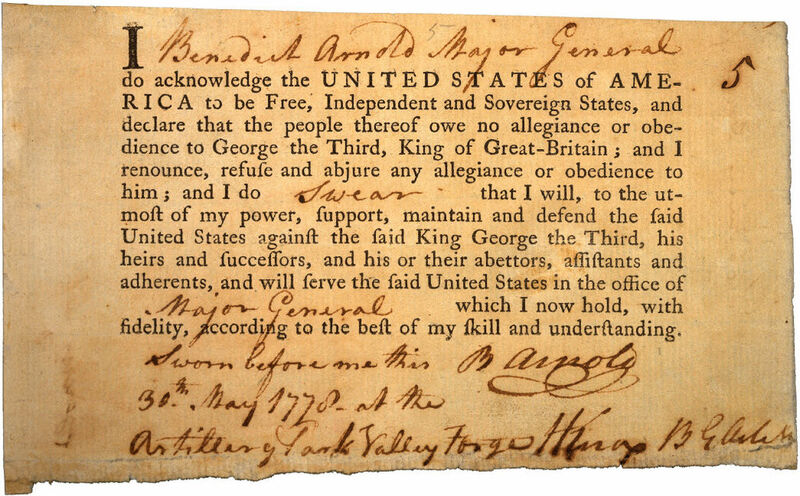 Benedict Arnold’s signed Oath of Alliance to the United States of America. Wounded at the Battle of Saratoga, Arnold took a leave absence to recover. His frustration mounted from lack of action, Congress’s refusal to promote him, and other commanders taking credit for his deeds. Additionally, he had used most of his small fortune to support the patriot cause, and Congress wasn’t reimbursing him. 1779: Benedict Arnold marries Miss Peggy Shippen, a young woman from Philadelphia. Peggy had several friends among British officers; there is much speculation regarding her influence on her husband’s historic decision and how her continued communication with her officer friends may have made the scheme possible. 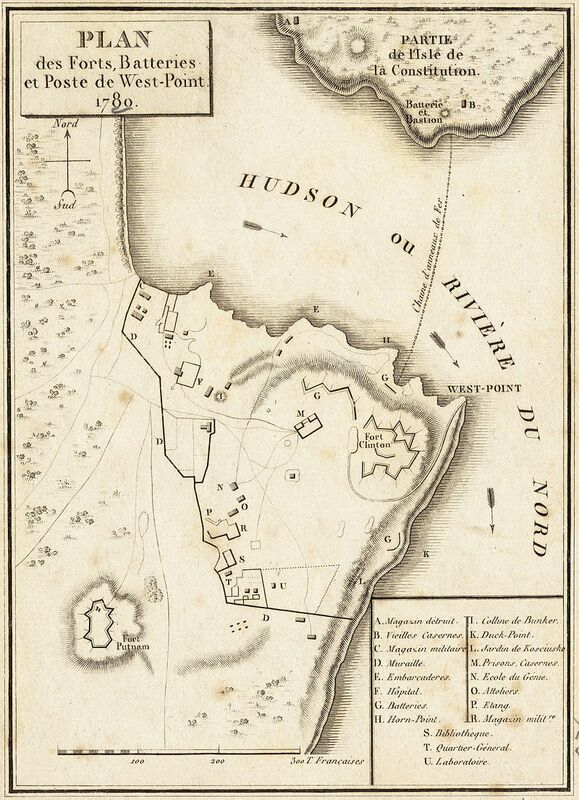 Benedict Arnold finally got something he wanted from Congress: the command of the fort at West Point, New York. (No, there wasn’t a military academy there in 1780, but it would later be built at the same location.) This was an important strategic location; only a trusted general would be placed there, and it seemed the perfect place for Arnold. His courage was admired, his loyalty was trusted, and it would keep him away from the campaigns which were challenging after his injury. However, Arnold was still disgruntled, and the American cause seemed to faltering. Treachery was in his mind before the West Point command, but that post “sealed the deal.” The British wanted West Point…and they were willing to pay for it. Arnold needed money, may have thought the Americans were losing the war, and thought it would be a good idea to switch sides. The patriots discovered the plot when British Major John Andre was captured and the plot papers were discovered in his boots. (If you’re a spy, never hide the important papers in your shoes!) Andre would be hanged. Arnold, hearing that the plot was discovered, fled West Point, taking refuge on a British ship nearby on the river. Well, he got a brigadier general’s commission in the British Army, a reward of about 6,000 pounds (British money), and an annual pension for his attempt, but Benedict Arnold also got the universal title “traitor.” The Americans loathed him. And the British mistrusted him. Benedict Arnold spent the next few years raiding in Virginia and Connecticut. In 1782, he and Peggy fled to England, where King George welcomed them and the Whigs hated them. Five years later, he relocated to New Brunswick, attempting to re-start in the merchant trade. That didn’t work so well, and Arnold returned to London. He died in 1801. Benedict Arnold’s early tenacity and ambition accomplished some victories for America. He had the potential to continue and be one of Washington’s best generals. I think it’s important to recognize this aspect of Arnold’s life because it helps us understand the frightening effects of bitterness and greed. Angry at Congress and worried by his dwindling bank accounts, Arnold hid his frustration, watching the American cause struggling and looking for a way out. Instead of quietly resigning and returning to civilian life (which could’ve been an honorable solution giving his previous injury), he resorted to treachery. It was a way to “get back” at Congress, the generals he disagreed with, and make some money. Arnold’s store reminds me of the Scripture verse: For the love of money is a root of all kinds of evil, for which some have strayed from the faith in their greediness, and pierced themselves through with many sorrows. (1 Timothy 6:10) And it should be a warning to all of us to guard against bitterness and greed. P.S. For a very complete and detailed examination of Benedict Arnold’s war experiences and treachery, I’d recommend reading Valiant Ambition by Nathaniel Philbrick. It’s one of those splendid non-fiction book that reads like a novel! There is no question that Benedict Arnold (up to the end of 1777) was an American hero. Arnold’s march to Quebec, the Champlain battles of 1776, and his role at Stanwix and Saratoga were material American successes. Had he died of his wound after Saratoga, he would be regarded as such. However, for petty reasons you explain, he sold out his allegiance – and that overshadows everything else he did.